Outdoor summer meals are as (Norwegian) American as apple pie—with or without beer! 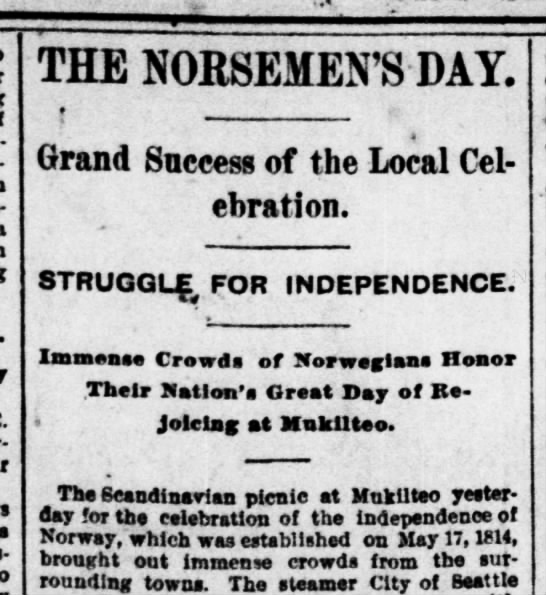 An 1891 article about the May 17 picnic recognizing Norway’s national day. Norwegians in Seattle and up and down Puget Sound traveled by boat to Mukilteo, Wash., for the event. Summertime picnics are about as American as baseball and apple pie. Never more so than in Norwegian communities. The word picnic is a corruption of the French pique-nique, a meal where each person contributes food. In North America, they took this French tradition, held indoors, and moved it outside. A cursory review of newspapers online tells us Norwegians enjoyed picnics as far back as the 1880s, the decade in which more Norwegians immigrated to the U.S. than any other decade (more than 180,000, according to the U.S. Dept. of Homeland Security). From Midwestern states like the Dakotas, Iowa, Illinois, Minnesota, and Wisconsin to the West Coast states of California, Oregon, and Washington, Norwegians and Norwegian Americans have held picnics. Review of newspaper articles about Norwegian picnics just in the United States reveal a head-spinning 267,000-plus articles since the 1890s. A Norwegian picnic sometimes included pjalt-style waffles, cured and smoked salmon, American elk sausage (to mirror reindeer sausage from the old country), smørbrød, and lingonberries. Washed down with a pils­ner beer or Norwegian aquavit. Bløtkake, a Norwegian cream cake, or flotegrot, a Norwegian pudding, would sometimes be served as dessert. Norwegian Constitution Day celebrations on or near May 17 have tended to kick off the picnic season of speeches, dancing, food, and beer. 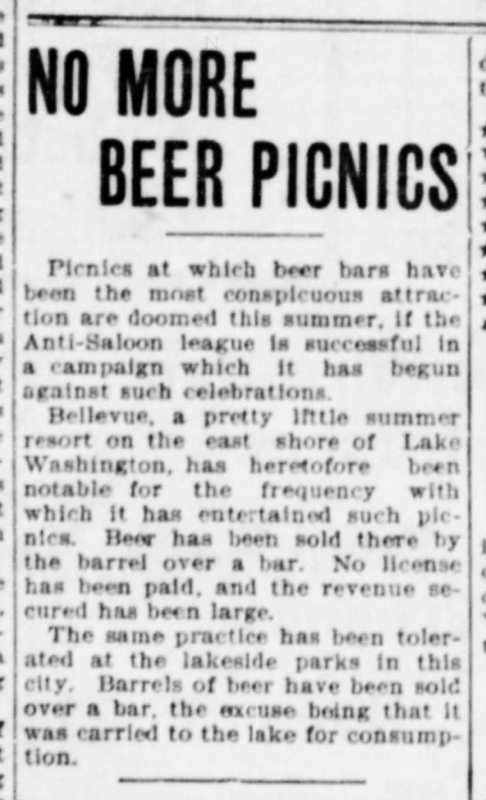 Norwegian Americans and others lamented the loss of having a mug of beer at their summer picnic in King County in 1905. In Seattle, steamers from Seattle and Tacoma plied Puget Sound to various sites like Amund Amunds’ picnic grounds near Alki Point in West Seattle in the 1880s and 1890s. Speakers at picnics reflected the times. In 1942 at a picnic of the Norwegian Lutheran Children’s Home in Chicago, American Ivan Jacobsen was the guest speaker. Jacobsen had been bicycling in Norway when Germany invaded the country. Arrested, he told about breaking his arm on a cot in order to be hospitalized, then successfully escape. In 1959, “gallons of Flotegrot” were featured at a picnic at the Norwegian Old People’s Home, also in Chicago. The recipe called for 30 gallons of whipping cream, 40 gallons of milk, farina, flour, sugar, and salt. One of the largest Norwegian picnics was held in Deerfield, Wis., in 1928. Some 10,000 turned out at the picnic, sponsored by seven Sons of Norway lodges. Over 100 years ago, sentiment around the flag stirred some people as it does today. Even at a Norwegian picnic where flotegrot and aquavit was served. Scott Larsen is a Roosevelt historian. He will be delivering talks about FDR and Crown Princess Märtha in the Pacific Northwest. If your group is interested in having Scott speak, email scottlarsen@shaw.ca.